If Shakespeare were a stock trader, he might poetically state that the market since August has been "full of sound and fury, signifying nothing." I am of the opinion that this rally will eventually break out of that range, at least for a few weeks or so, but I think it's likely we head a bit lower first. I always use the market action and price as my most important indicators, but there is another indicator that's worth mentioning at this juncture. The Volatility Index (VIX) has been trading in a range since August, similar to the SPX; and, also similar to the SPX, it recently whipsawed out of that range and immediately back into it. Whipsaws often lead to strong moves in the opposite direction (see recent rally). 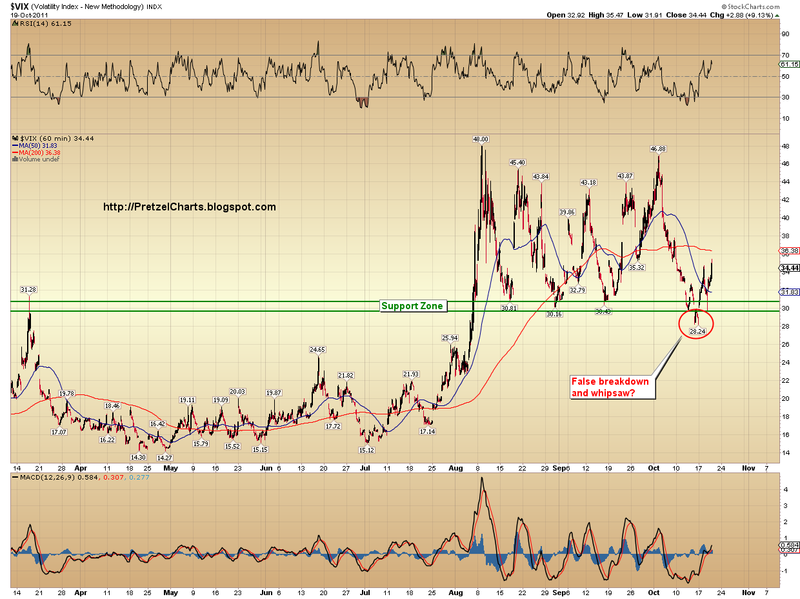 If the VIX continues rising here, that would be bearish for stocks. I'm not suggesting the VIX will return all the way to the top of its range -- however, if it did, that would obviously have very bearish implications for the broad market. 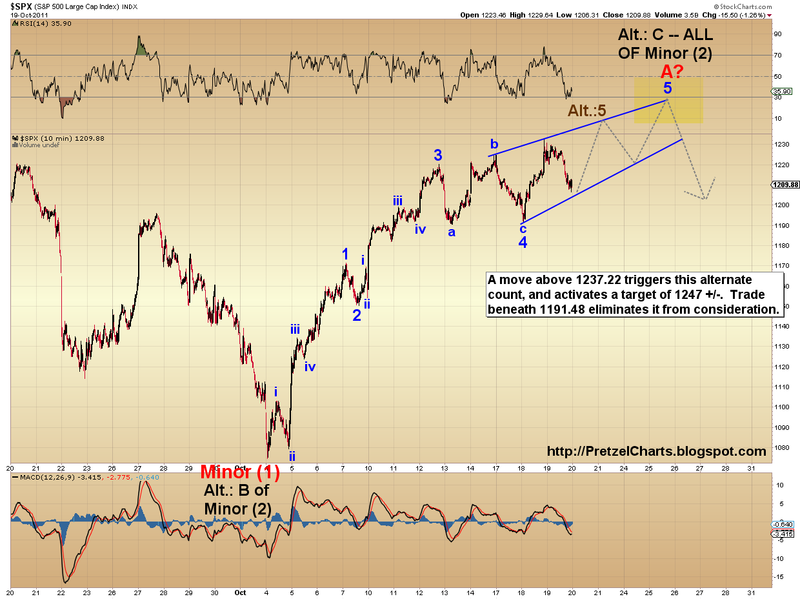 Finally, the short-term wave counts are starting to come to light. In the case of tops, much more so than bottoms, it can be difficult to nail the exact turn; especially when the larger preceding waves were sideways and open to several interpretations, as has been the case since August. Nevertheless, the market has finally revealed enough structure to allow me to narrow my counts to the three most likely possibilities. Of those three, two of the counts are apparent, and one is speculative -- and the speculative count is one we should be able to confirm or rule out fairly quickly. The chart below portrays the two most apparent counts, and their most likely resolutions. I have simplified the labeling to show only the ending points of the larger waves, ostensibly to make it easier for viewers to follow (but in reality, largely because I accidentally deleted my more detailed chart!). The preferred count is shown in red, and argues that Wave A completed its top on Tuesday, and is now in the process of correcting down toward the 1125 zone. The alternate count is shown in turquoise and argues that Wave A actually completed at a lower price point (1224) than the orthodox top, and the market is now forming what's called an "expanded flat." In an expanded flat, the b-wave of the correction actually exceeds the price high of the larger preceeding wave (see "Alt: (b)" label, which is higher than the preceeding "Alt: A" wave); and the c-wave is then disproportionately long relative to the a-wave (see "Alt: (c)" label). If this alternate count is playing out, the 1175 zone would be the likely target zone for a bounce and resumption of the rally. Probably not coincidentally, the 20-day moving average is also crossing approximately 1170 right now. 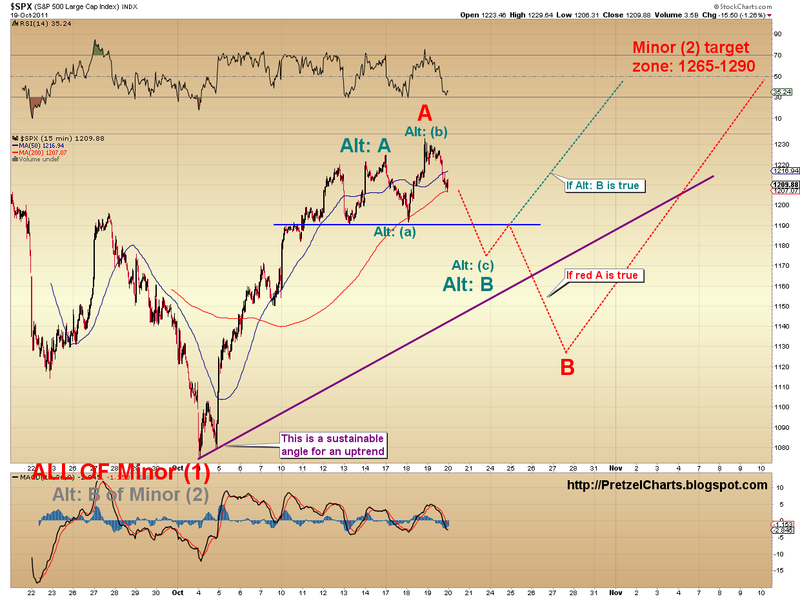 Those are the two most visibly apparent options, based on what the market has revealed thus far. My "speculative count" is shown below. From a purely technical standpoint, I am actually somewhat partial to this speculation. Here's why: the wave labeled blue "a" on the chart below is almost certainly a five-wave impulse, not a 3-wave correction. In fact, the structure of that wave is what led me to previously believe - for a couple days anyway - that October 12th (SPX 1220) likely marked the top of the larger red A wave. Impulse waves must be followed by at least one more impulse in the same direction, and there is nothing to pair the blue a-wave with other than the wave labeled blue "c". Hence the two impulse waves complete the pair, which in turn completes a larger wave; in this case: blue "4". Otherwise, the blue a-wave is something of an anomaly to any other labeling of the structure. Further, the fifth wave of red wave A should either be an impulse wave, or an ending diagonal of some type. If we accept the labeling of blue "4," then it becomes very difficult to view Tuesday's move to the 1233 high as as a five-wave impulse to form a complete fifth wave. It certainly appears to be a three-wave move, which lends itself to being part of a corrective sequence or ending diagonal (either the end of one, as detailed yesterday, or the start of one as shown above). Outside of drilling-down on the technicalities of which wave is what, the other thing that an ending diagonal could accomplish here would be to work off some of the bearishness present in the equity put/call ratio, which remains very elevated. Of course, the rising VIX might contradict that whole theory. Either way, this speculative count can likely be ruled out with a trip beneath 1190, and likely confirmed with a move over the recent highs. Each day going forward, the market will reveal a few more pieces of this jigsaw puzzle. At this juncture in the market, most forms of technical analysis can't tell you much more than "the market is near long-term resistance, and 1190 is short-term support." One of the beauties of Elliott Wave is that it's one of the only forms of technical analysis that even allows us to make detailed projections in a sideways market like this. No one can say for sure exactly what's going to happen here, but at least with Elliott Theory, we have a pretty good idea of what to look for. Trade safe! One of your more complicated posts to follow, but I understand that is a reflection of the murky market action right now. 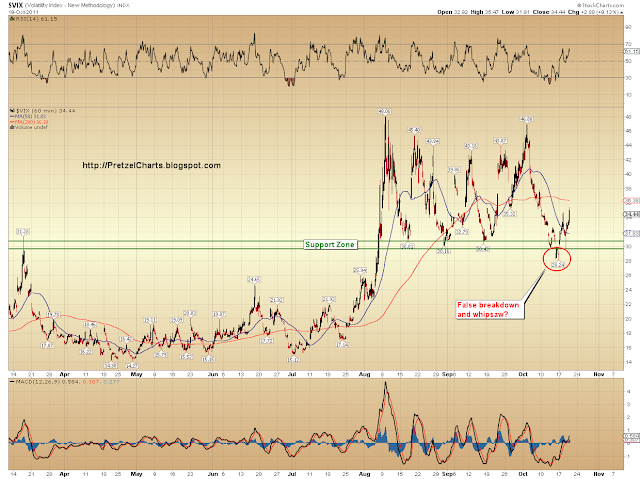 I suspect the market will hold above support until after options expiration Friday. Hmm. Sorry. Definitely got into the technical end of things a bit... trying to educate, hopefully I didn't make it too technical. Yeah, I've been anticipating we'd trade sideways this week too. No worries, I appreciate the education. Stretching the brain always hurts a little. Just completed what looks like an impulse move off the 1233 top, so it's likely we can rule out the ending diagonal count. Should see a little rally here. By ruling out the ending diagonal, am I correct that the speculative count is discarded? This thing could get ugly fast when 1190 goes. Time for a little rally. SPX is rallying now right this minute up into the 50 period ma, is this what you mean (5 min chart)? Great post! I found your blog a week ago and it has fast become my favorite destination for market analysis. I have having alot of trouble reconciling the convention count (that wave A topped Wednesday) with some of my cycle work as well as my wave counts on other risk assets. When I saw your speculation count the light bulb went off as it would make all the puzzle pieces fit together. Thanks so much for sharing your work. Do you use Hurst cycles, or something else? What is your work telling you? Yes, I do use Hurst cycles primarily, but also some other cycle methods. My analysis was pointing to a continued choppy advance into late October to early November before a more severe pullback (or even a resumption of the bear market at that point in time). Basically your ending diagonal speculation count fits perfectly with the scenario suggested by my cycle work. Furthermore, I thought it was interesting today how the SPX held above the 1190 low as it had to in order to keep the ED on the table, even while the NDX significantly undercut it's Tuesday low. 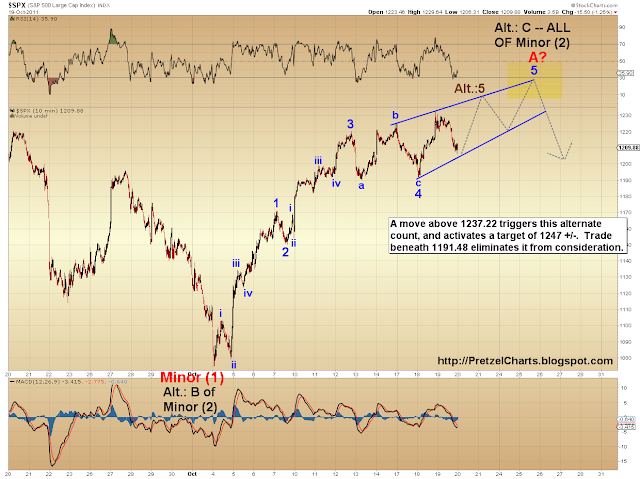 Maybe that was the market sending us a clue about the correct wave count. We should find out tomorrow or Monday at the latest one way or the other, as today's action saw a small point change in the McClellan Oscillator, something that usually signifies a big move coming in the next 1-2 days. Alot of folks are going to get caught leaning the wrong way and the squeeze will be on. And I think your speculation count would be the one that would catch the majority wrong footed which is something the market likes to do ;-)... Time well tell. This week, the market's been in one of those modes where the ST possibilities start to seem endless -- which also argues for a fourth wave (never been a big fan of fourth waves). I'm working on a chart of the RUT right now, and the rally there counts pretty well as an a-b-c. Of course, c could be an extended third, which would put RUT in a 4th too. The argument against a 4th is that RUT broke its lower trendline -- so we'll see what happens at the backtest I'm expecting tomorrow. I'll post the chart before the open. 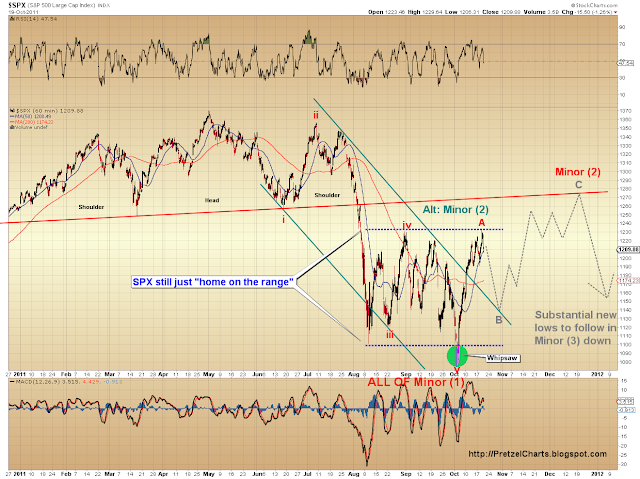 If you have a chance see if you can work up an e-wave count for KRE, the regional banking ETF. Something definitely seems to be afoot there as the relative strength for that sector off the 10/4 low has been very pronounced to my eye. This sector has been a perennial laggard due to the housing market woes, so I wonder why the sudden strength and if it sending any kind of message in regard to the rest of the market. Oh well gotta get some sleep and rest up for a potentially wild market day tomorrow. Thanks, I'll take a look at that chart this weekend.